For people recovering from a stroke, even the simplest motions can become a struggle. To lift a hand, for example, requires a signal from the brain that travels all the way down an arm to the hand. That’s a lot of moving parts — and when something is damaged, it makes regaining those skills an arduous and slow process. That could all change, though, with the help of some innovation and advances in virtual reality. It was almost by chance that USC researcher Sook-Lei Liew started thinking about virtual reality. She was a neuroscientist, and so was her husband. When she became a USC faculty member in 2015, her husband got a job in the Mixed Reality Lab at the USC Institute for Creative Technologies — and, between the two, a brain trust was born between VR and stroke rehab. For Liew, the light bulbs really started to flash when she attended the Neurotech conference — a big, industry-academic partnership featuring the latest in tech advances. Liew had already been working on stroke rehab for awhile and worked on brain-feedback interfaces, devices that essentially allow patients to see what is going on inside their brains to encourage them to build circuitry. At the Neurotech conference, something clicked. 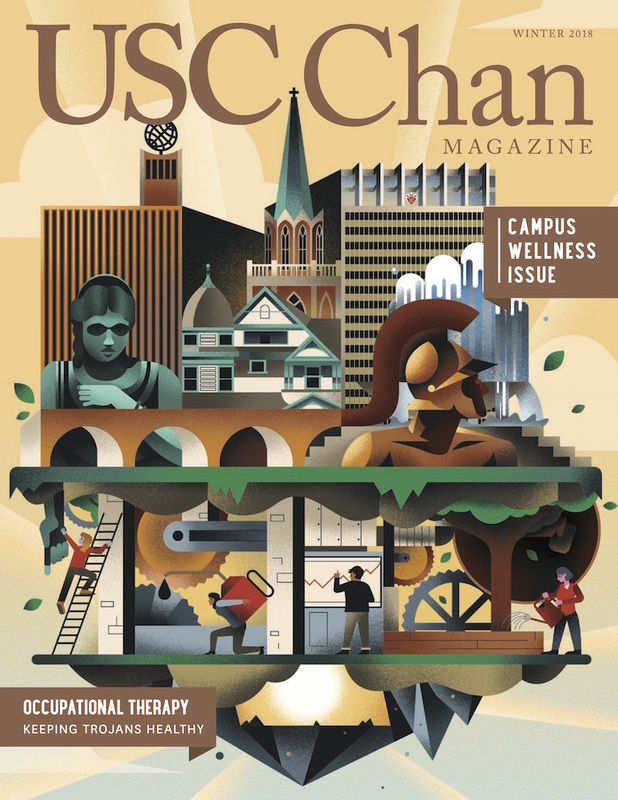 “There was a lot of tech, but not a lot of science behind it,” says Liew, who also has joint appointments with the USC Division of Biokinesiology and Physical Therapy as well as the Department of Neurology and the Mark and Mary Stevens Neuroimaging and Informatics Institute at the Keck School of Medicine of USC. Liew started to dig into VR research and found some fascinating studies about bodies inside a VR system. One study showed that if you give someone an avatar with long arms in the virtual world, they interactwith the real world as if they had long arms. The effect even lasts for 10 or 15 minutes after a person removes the VR headset. And another study showed if you give someone a child-like body in VR, that person starts to have more child-like features in the real world. 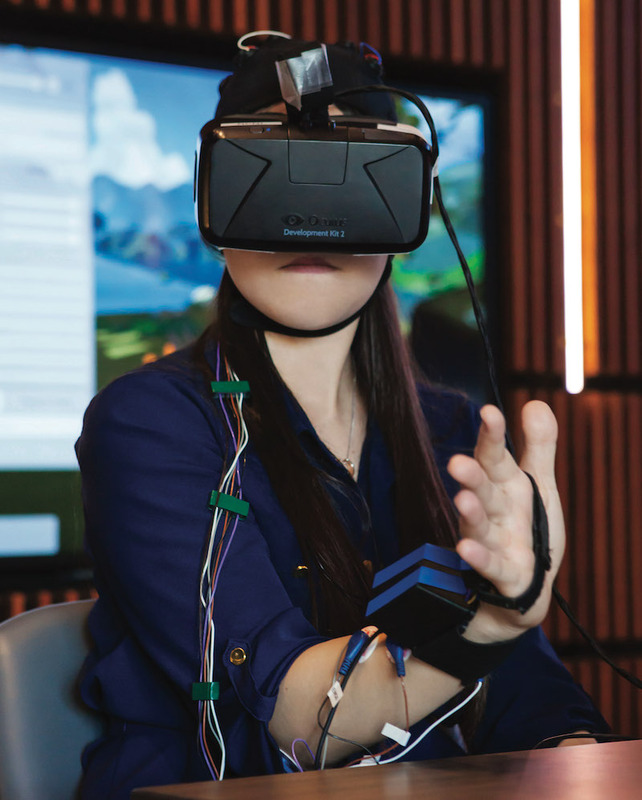 She launched a project in January 2016 with a grant proposal to the American Heart Association and received $150,000 to explore the possibility of a VR brain-computer interface to treat stroke survivors. She and her colleagues (initially her husband, but then other researchers) wanted to create something that was low-cost and portable. Her lab, the Neural Plasticity and Neurorehabilitation Laboratory, was home base for the work. Most brain-computer interfaces use functional magnetic resistance imaging (fMRI), a huge and expensive technology that measures brain activity by detecting changes associated with blood flow. That made it all the more vital to get the device to people, rather than have people come to the tool. The team built a prototype using a laptop computer, an off-the-shelf VR rig, a $9 swim cap and an open-source brain-computer interface electroencephalogram (EEG) system. Liew used her mother’s sewing machine to stitch the electrodes to the cap. The whole system costs less than $5,000. It’s called REINVENT: Rehabilitation Environment using the Integration of Neuromuscular-based Virtual Enhancements for Neural Training. 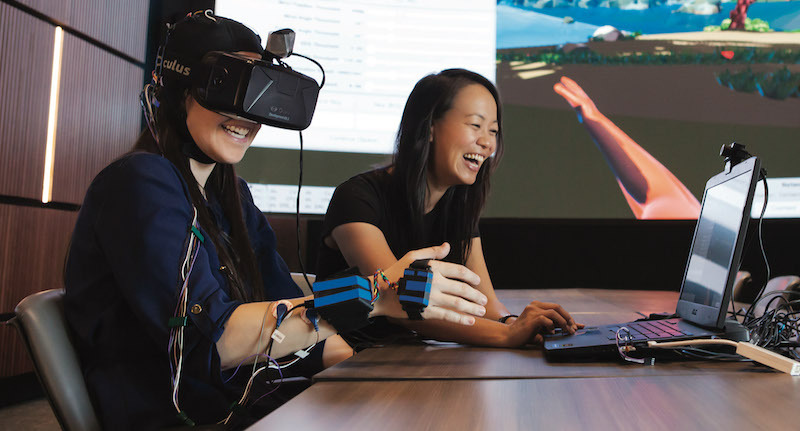 This is how it works: The system uses virtual reality as well as brain and muscle sensors to show arm and hand movement in the virtual world when the patient has activated the correct brain and muscle signals, even if the patient cannot move his or her arm or hand in the real world. Over time, they can train the damaged circuits to work again. So far, the system has only been tested on healthy older adults, but in the next six months it will be tested on people recovering from a stroke. Ryan Spicer, a programmer analyst on the project, pointed out that older adults are generally a population that isn’t thought of as VR adopters — but some of them were very interested. The initial results showed that the healthy older adults were happy to use VR. Spicer says that, in the future, the activities and art could be tailored to each person’s interests. The team demonstrated the project at the South by Southwest festival this year, and the experience was mind-bending for Liew. “Our booth was across the hall from NASA, and they had a Mars habitat. Whereas we had a system that was sewn together with my mom’s sewing machine,” she says, with a laugh. Still, she says they received great feedback during the conference. Out of 38 VR demonstrations, REINVENT won a special prize: Special Jury Recognition for Innovative Use of Virtual Reality Technology in the Field of Health. Liew is certain to play a role in shaping the future, thanks to a new federally funded grant that she received in March. The $530,000 award from the NIH National Institute of Child Health and Human Development will fund Liew’s “Big Data Neuroimaging to Predict Motor Behavior After Stroke” study. Liew and her team will apply advanced computing techniques to a very large database of brain images and behavioral information gathered from thousands of participants worldwide. The ultimate goal is to reveal neural and behavioral biomarkers hidden within the “big data” in order to better predict stroke recovery potential and to personalize rehab treatments. The four-year project will be funded through 2020. Are people in the future going to be controlling houses and cars with their brains? Liew thinks it’s unlikely. That could include, for example, immersive worlds to distract people while they’re getting chemo in the hospital. “It’s a way to take your body out of a situation,” Liew says. David Krum, a computer scientist on the team, agrees. Liew sees VR as a true interdisciplinary venture.